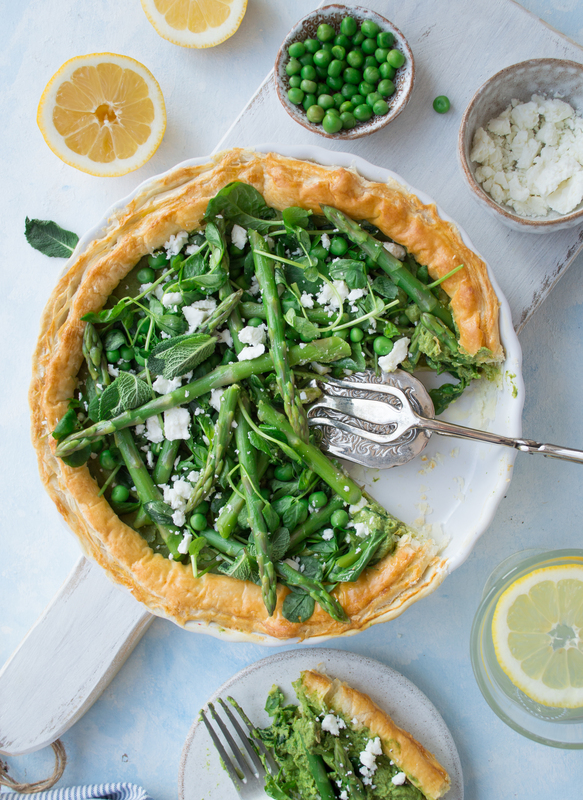 If you love asparagus, this crunchy, crispy & fresh asparagus tart with zingy pea & mint pesto will be a perfect vegetarian addition to any table. You can make it ahead and re-heat in the oven just before serving. I don’t know about you but I’m a huge fan of asparagus. Not only is it full of flavour but it also signifies the arrival of spring and all the fresh new spring produce. 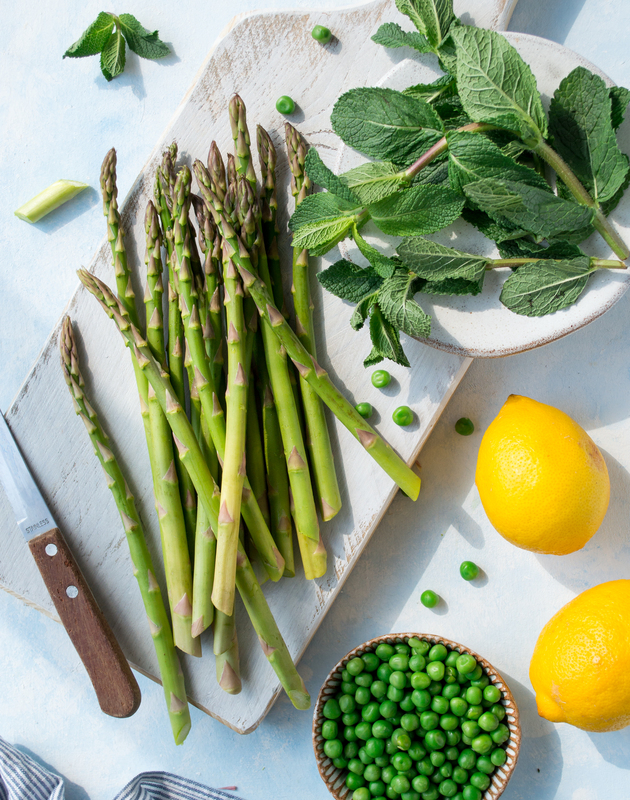 I get far too excited going round the farmers market at this time of the year – it certainly puts a spring into my step seeing all the fresh, vibrant and colourful spring veggies. 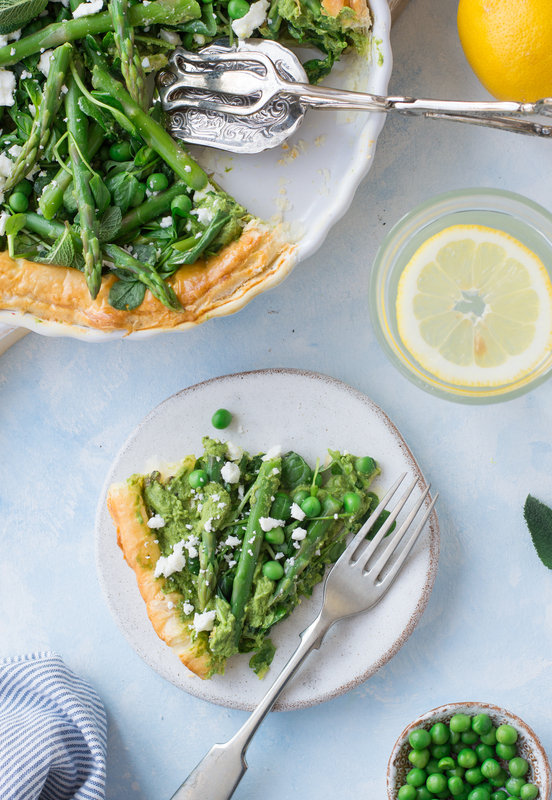 If you want to make the best of the asparagus season, this tart should be right after your heart. It only requires a few ingredients and very little work. It looks rather impressive on the table too, so it’s a great number for your Easter parties. 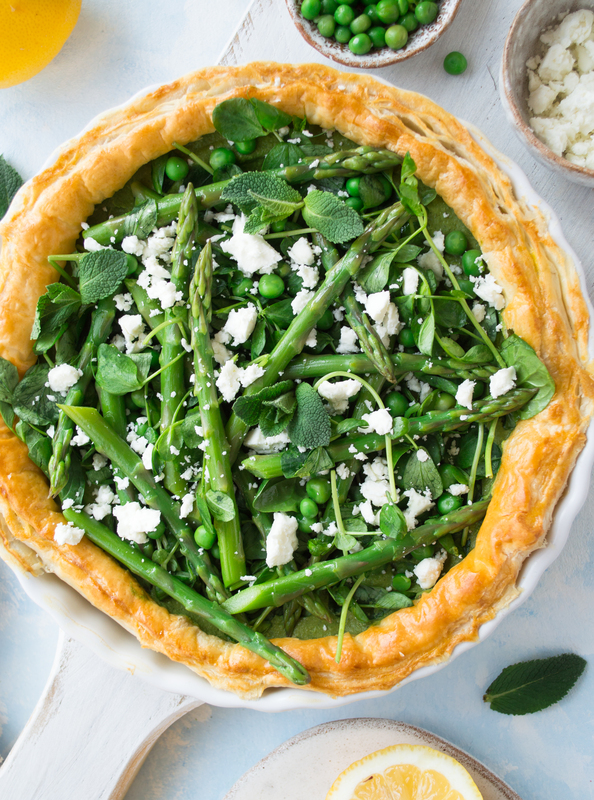 I paired this asparagus tart with pea & mint pesto, which, in my humble opinion, compliments the tart really well and adds a new layer of freshness, whilst asparagus makes it crunchy and puff pastry adds that lovely edge of crispiness. Fresh, crunchy, crispy & minty is an almighty combination, don’t you think? 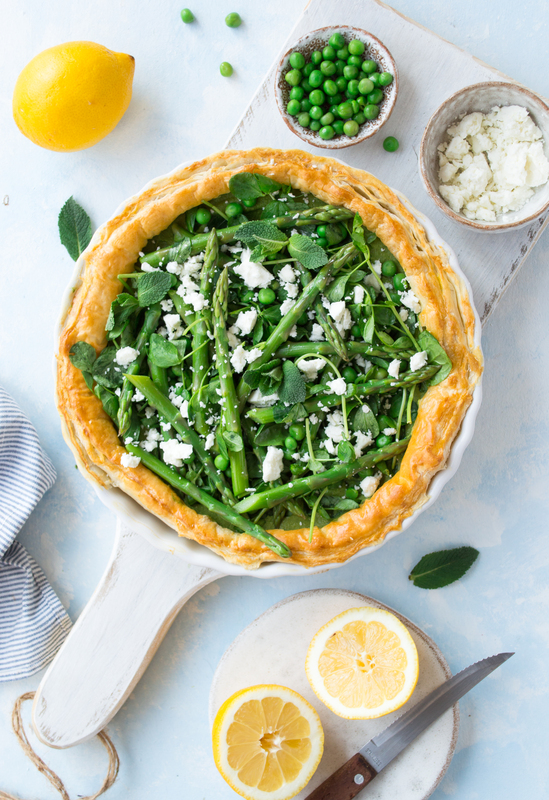 I really hope you get to enjoy this delicious asparagus tart. If you make it, be sure to drop a comment below and tag me on Instagram (@fit.foodie.nutter #fitfoodienutter), so I can see your take on it. 1. Preheat the oven to 180C fan. 2. Brush 20cm tart pan with a little olive oil to stop the pastry sticking to the pan. Roll out the puff pastry sheet and lay it over the pan. Gently tuck in the sheet around the base and the sides of the pan with the tips of your fingers ensuring that the pastry goes all the way up to the sides of the pan. 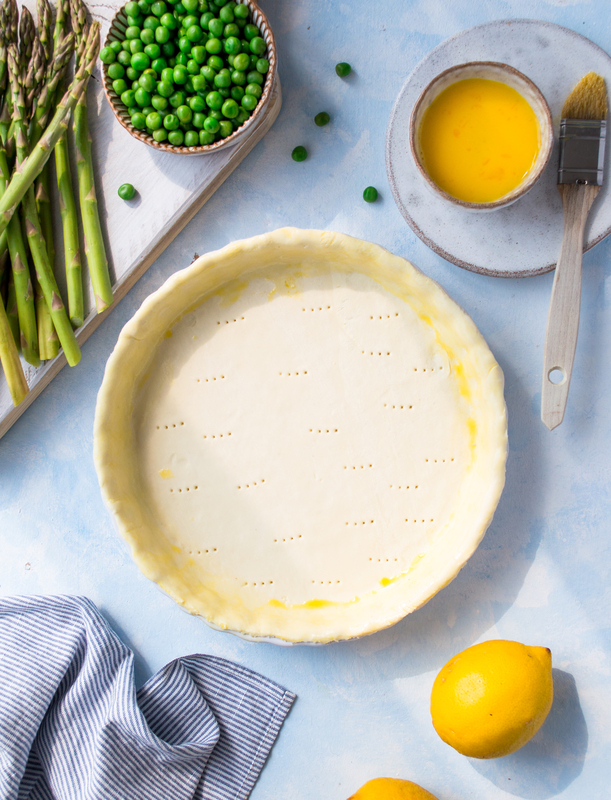 Cut off the excess pastry by tracing the knife around the edge of the tart pan. Gently prick the base with a fork. 3. Brush the pastry with the egg using a pastry brush. Add the ceramic baking beans or dried pulses to the base of the pan and bake for around 15 minutes or until the pastry is firm. Then remove the beans and cook for another 5 minutes until the pastry turns golden brown. 4. Prepare the pea & mint pesto by combining all ingredients in a blender. Blend until smooth. When adding the water, do it a tablespoon at a time to ensure the pesto doesn’t turn out too thin. You want the consistency to be quite thick and firm, otherwise it’ll be too runny and will make the pastry soggy. 5. 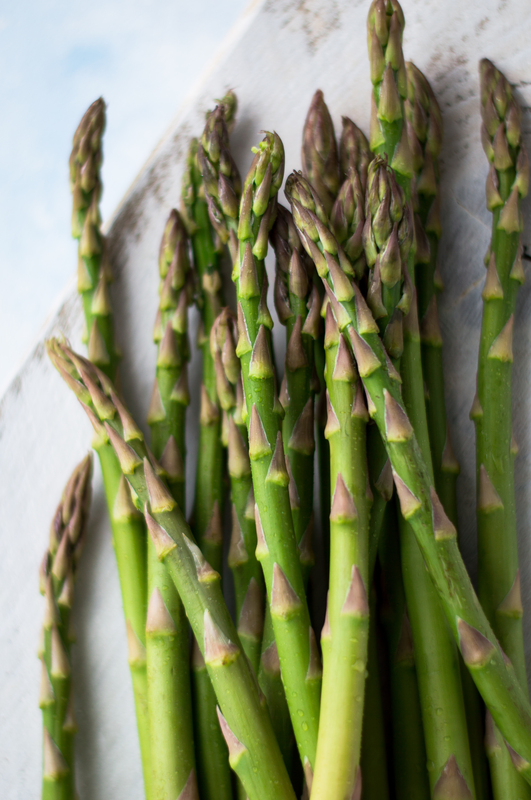 To cook the asparagus, bring a pan of water to a boil. Add the asparagus to the pan and cook for 3-4 minutes until tender yet slightly crunchy. Drain and run under ice cold water to stop the asparagus from cooking further. Transfer in a bowl, season with salt & pepper and toss in 1 tbsp olive oil. Set aside. *If you prefer to serve the asparagus warm, place it in a sieve and re-heat by pouring boiling water over it. 6. 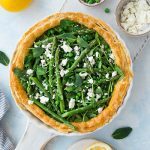 To assemble the tart, fill the base of the pan with pesto, scatter pea shoots and green peas, top with asparagus and sprinkle with feta cheese. Serve immediately. 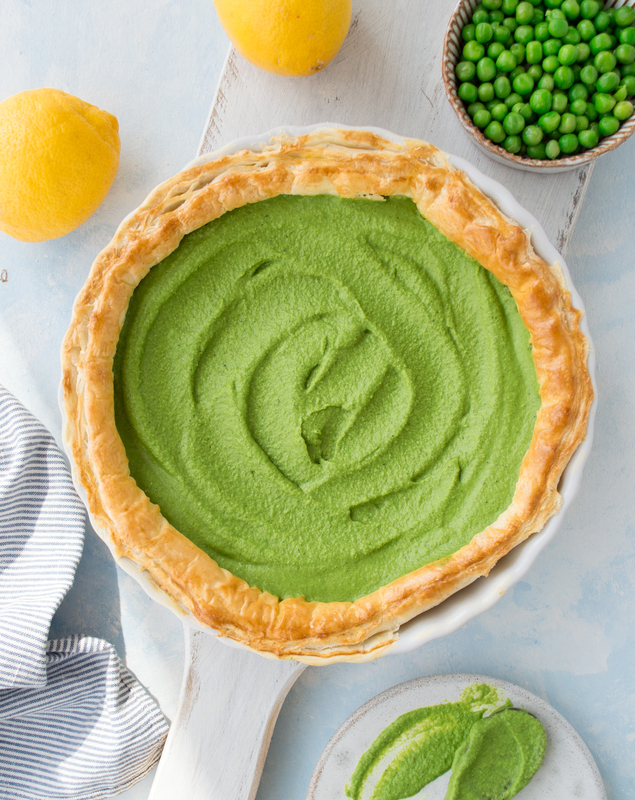 Your photos of this tart make it all the more mouthwatering. I bet I would love this dish and will have to attempt to make it later this week. I’m so excited! Yum’d to save for later. Amazing and unique combination to this Tart. Wish to try it out.